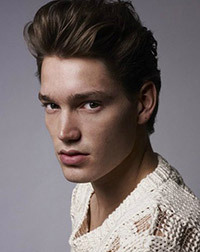 Alex Gilbert was born in Fulham, England, United Kingdom, on 1989, is an British male model. He was discovered in his home town, by model scout from modeling agency Select Model Mgmt. Alex's hobbies are football, running and drawing. His favorite foods is Italian foods. Twist Magazine, OAKAZINE TAMPA, Wonderland, i-D Magazine, British Vogue, Hercules, GQ Style Germany, Numero Homme, Love Magazine, GQ Style UK, L'Officiel Hommes Paris. Cerruti, Tween, DSquared2, Aquascutum, Replay, United Colors of Benetton, Sasch, Valextra, D&G. Represented by agencies Select Model Management London, New Madison Paris, Photo Genics Los Angeles, Why Not Model Management Milan. Currently I'm obsessed with autobiographies and my new phone.